Hug, shake hands, smile, back-slap or a playful punch--when it comes to greet a friend, there are many options. But now with internet savvy youngsters the options are beyond counting. Now we can scrap a nice animated, glitter image or graphic to our friends on Orkut or Comment them on Myspace, friendster, hi5 etc. We all know the evening is the best time of the day to share with friends. We love to hang out with friends, take coffee or beer and just discuss any thing with them. 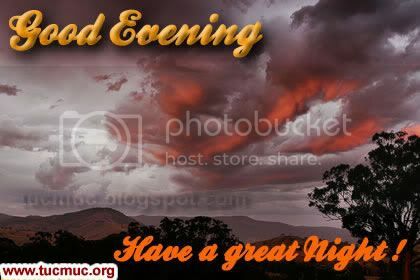 Here we are providing Good Evening images and comment graphics, so you can greet the friends.